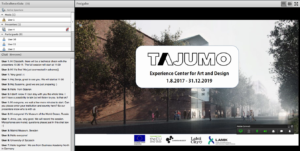 New (digital) concepts for museums – the team from Lahti University of Applied Sciences in Finland shared their experiences in TAJUMO project and other experiences of digitization for museums. The new Lahti Art & Design Center will encompass both a museum, but also research, business and service organisations, to create unique experiences for visitors. Under the headline „New Lahti Art & Design Center – Lessons Learned in (Digital) Service Development“, Mr. Mika Kylänen (Principal Lecturer), Ms. Katariina Mäenpää (PhD, works as RDI specialist / project manager) and Mr. Antti Heinonen (Senior Lecturer at the Insitute of Design / visual design and media) discussed their experiences and cooperation possibilities with the BalticMuseums team. Katariina presented the Lahti Art & Design Center project (TAJUMO) and lessons learned so far. “We are consuming experiences, not products”, she explains one main thought of the project. 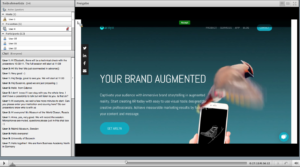 Antti shed light on the possibilities of Augmented reality and media production. After a benchmarking study of digital concepts in museums, teams of students from Lahti UAS work on concepts for wayfinding system supported by Augmented Reality, gamified solutions for data collection from visitors or a virtual exhibition for furniture. 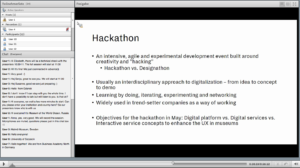 Mika explained the Lahti teams’ experience in organising hackathons and discussed possibilities for joining the BalticMuseums hackathon – Baltathon – in May 2019 in Greifswald. introduce tools for innovative service development using canvas.